Thank you for helping us to persuade Orange that this business decision should take the Disability Discrimination Act into consideration. Who is / was WildFire? Original Campaign Site, including all posts. In May 2005 ORANGE customers who subscribed to the WildFire service were given less than a months notice that the service was going to be terminated with no equivalent replacement service being provided. Within hours Kate and her close friend Rory Heap had mounted this online and radio campaign to either save WildFire or persuade ORANGE to provide an accessible alternative to WildFire to enable its customers to access their phone book and messages without needing to read the screen or touch the buttons of their handset. Firstly we pointed out the need for ORANGE to consider the provisions of the Disability Discrimination Act and gave guidance to all WildFire users and their friends and relatives about how best to lobby ORANGE via telephone, email, online petitions, media coverage and simple voting with their cash. This guidance included setting out all the salient points about the issue that had not been considered by ORANGE. We then got into contact with the Disability Rights Commission, RNIB and Radio 4. Campaign Feedback : We received 436 submissions on our site from Orange customers (and some staff) ranging from resigned dismay to incandescent rage. Wildfire Survey: Please go and fill out this Survey. The survey is set up to see whether it is economically viable to set up wildfire, and is one possible solution to her loss. Other Links : We're not the only ones who think this way. Check out www.savewildfire.com and make sure to go to this Petition to Save Wildfire and add your name. News Articles : "Orange blasted for extinguishing Wildfire" from The Register. Thanks to Tim Richardson for picking up on this. News Articles : "Orange snuffs out Wildfire" from The Register is the first news article to pick up on this. Orange Response to this campaign: Orange have a page up about their decision, and a FAQ about the closure. Worth reading, but frankly comments like "Over the last eighteen months user numbers have declined and with fewer and fewer Wildfire customers, it's now become financially and technically impractical to run as a service." sound a bit false when you can see that they have in fact closed the Wildfire service to new customers for 2 years. More Orange spin : "The TALKS software is the nearest thing on the market that we could find to the Wildfire service and that's why we're offering all customers with sensory disabilities the free software." Not really true, they are giving the TALKS software because of this website and the support of everyone who has posted here. I'd say that it makes a big wakeup call for Orange, but not big enough! Wildfire Reprieve : Orange said that they would keep her going until 1st July, rather than turning her off on 1st June. They announced this in the "In Touch" interview (on Radio 4, Tues 17th May). 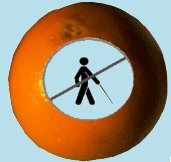 At present ORANGE say 58 people they know to be visually impaired are using Wildfire, doubtless there are many more who have not identified themselves as visually impaired to Wildfire. I was one! If you want to register yourself as a user (VI or not) who wants Wildfire to stay on then add your name at the right hand of this page. The mobile phone company Orange (www.orange.co.uk) is in the process of rolling out a new speech recognition service for its phones - 'Wildfire'. ... Wildfire is run exclusively at the 'server-end' - you phone the network, and Wildfire's intelligence resides on a remote computer-system. This means that features can be added, and yet your phone need not be upgraded or customised in any particular way. Wildfire is simply a short dial away, rather like BT's Call Minder system with a sprinkling of extra personification and voice-activation." She is a voicemail system that recognises voice commands and acts on them. She can store contact information about people and interact with callers when they reach your voicemail (Wildfire). She asks their name and their number (unless she knows them already). Wildfire is the brand name of a product marketed by Wildfire Communications Inc, offered to phone operators all over the world. Orange is the only UK network to offer it to customers, and is the only network in the world to offer it without charging an additional monthly subscription. Orange offers wildfire at answer phone call charges, and if you are on an OVP price plan with free answer phone access, for free. You pay a 11.75 one-off connection charge to start using Wildfire. If connected, to get Wildfire's attention, you just say "Wildfire"
With Wildfire listening, you can simply say "Call Albert". If Wildfire has more than one number recorded for Albert, she will ask which number to call. Wildfire supports call waiting, and you can use her to set call diversion. You can use Wildfire from another phone (even from a fixed phone) and place calls, charging them to your Orange account. If you use your mobile phone when you are driving, or are otherwise unable to look numbers up or press buttons to connect, or if you are disabled, Wildfire is a wonderful boon. If you have all your contact information stored in Wildfire, it is attached to your Orange account, and is available from any handset you use, but there is no way to get it all out if you decide to change networks (Or if Orange decide to disconnect Wildfire!). "Discrimination is often unintentional and may stem from a lack of awareness about disability, or from making incorrect assumptions. Service providers should plan for reasonable adjustments to meet the needs of their disabled customers, including both personal users and the employees of business customers. Where necessary and reasonable, service providers are under a legal obligation to adjust the way they provide their services so that disabled people can use them." "Not all disabled people classify themselves as disabled, or wish to highlight their disability. Employees and representatives of service providers should therefore exercise a degree of sensitivity, and not readily expect people to be able to immediately articulate their specific needs or to be aware of products which the service provider offers. Where there is doubt, service provider employees should ask disabled customers how best they might be served. " requiring a disabled customer to provide more information than a non-disabled customer in order to obtain a product or service." consult disability organisations for assistance and information on disability issues." To date Orange have stated that The withdrawal is based on a business decision by Orange and "... cannot be changed on an individual basis." which was not what we were asking them to do and that "Senior Managers are considering the request to provide TALKS as an alternative". DON'T LET ORANGE TAKE AWAY OUR ABILITY TO USE TECHNOLOGY AS EASILY AS EVERYONE ELSE! FIGHT FOR RETENTION OF WILDFIRE OR PROVISION OF AN EQUIVALENT TECHNOLOGY AT AN EQUIVALENT PRICE! ACT NOW USING THE ABOVE INFORMATION AND PASS THIS ON TO ANYONE YOU THINK MIGHT HELP.